Check scan. there are a couple wax stains on back of card. Larry Csonka. This card shows him in his NEW YORK GIANTS uniform! Football fullback. BEAUTIFUL 1971 Topps #45 Larry Csonka, Miami Dolphins, NM BEAUTY! Card is centered 35-65 LR and 35-65 TB with perfect color, gloss and focus. Card has just a touch of corner and edge wear. Card has clean front surface. Card is free of any creases. Card has a clean back. Item pictured is the exact one you will receive. YOU ARE BUYING ONLY THE: CSONKA. CONDITION: NEAR MINT. 1971 Topps Larry Csonka!! #45 (Dolphins) !! Look!!! All cards are from my personal collection. I am not a professional card dealer or grader and seek to describe the condition of the card as it appears to my untrained eye. The card you see in the scan is the card you will receive. Card is in NRMT condition. 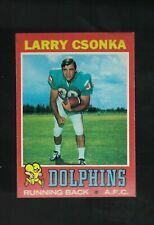 1969 Topps Football #120 Larry Csonka. Estimated condition is ExMt. Light corner and edge wear. Shipped with USPS First Class Package. Real nice card of Csonka's Rookie 4 in 1 insert. BEAUTIFUL AND RARE LARRY CSONKA ROOKIE FOUR IN ONE. LOOKS FANTASTIC SLABBED IN THE THICK BVG CLEAR PLASTIC HOLDER. Players: Larry Csonka, Ron Mix, Jim Nance, & Jim Dunaway. Condition: BVG 6 EX/MT. Card is in Nr-Mt or better condition with a clean front and back, no creases/wrinkles and descent corners. Card is in Ex-Mt or better condition with a clean front and back, no creases/wrinkles and descent corners. 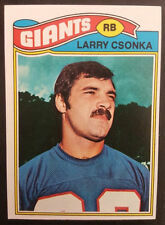 Player: Larry Csonka. Team: Miami Dolphins. Year: 1971.